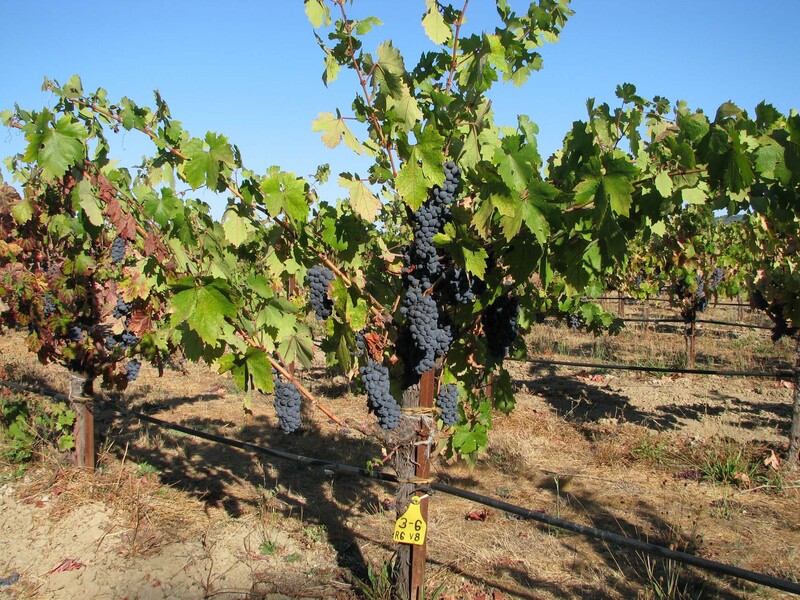 Many North Coast Zinfandel winegrape growers plant “field selections” of this variety at the request of wine makers who want grapes sourced from heritage vineyards with a history of producing high quality wines. 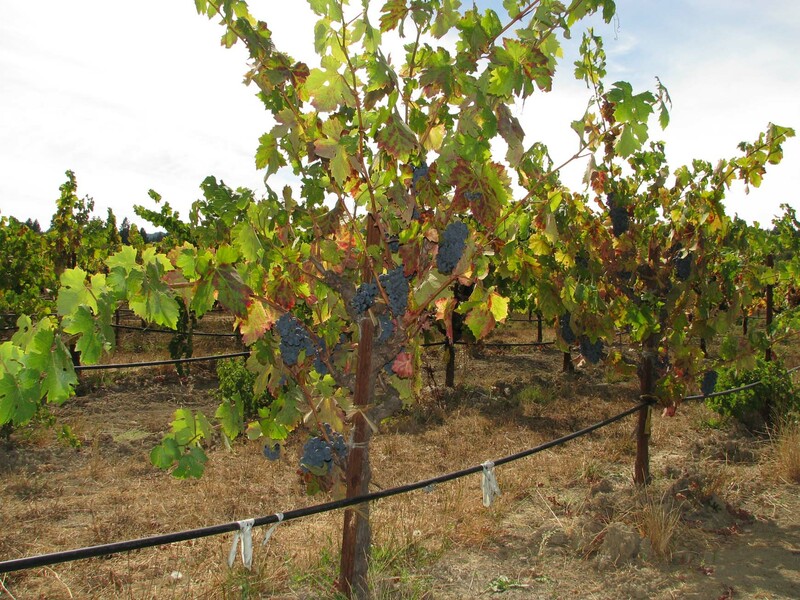 There is an inherent risk associated with this practice in that graft transmissible viruses are likely to be present in vineyards propagated from planting stock that has not originated from virus tested stock. 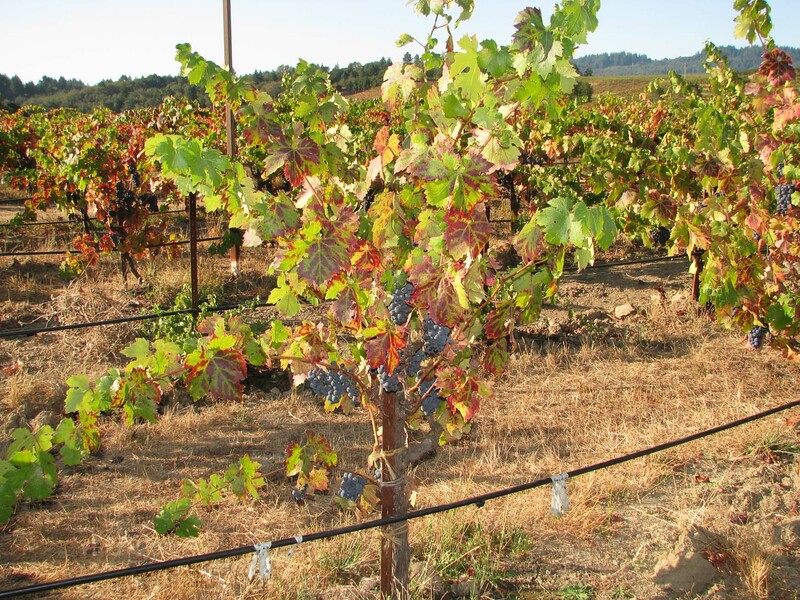 A trial was established to evaluate the performance of popular Zinfandel field selections believed to have variable incidence of grapevine leafroll disease. Eight field selections of Zinfandel and one of Primativo were evaluated in Dry Creek Valley, Sonoma County; an American Viticultural Area known as a traditional Zinfandel growing region and one of several with Zinfandel vineyards of historical significance. Yield components, fruit composition and vine growth were evaluated annually from 2008 to 2011. Selection effects on yield, cluster weight, cluster number and pruning weight were independent of year. Across all years, the Primativo selection had the lowest yields and cluster weights. Individual vines which tested positive for the presence of Grapevine leafroll associated virus-2 (GLRaV-2) had significantly reduced pruning weights and fewer clusters as compared to vines testing negative. Selections were field budded in 2004 in a randomized complete block design onto one-year old 110R rootstock (Vitis berlandieri x V. rupestris) planted 2.4 m by 1.8 m, row by vine. There were 6 replications and 8 vines per replicate; vines were head trained, spur pruned and at maturity had 6 to 8 two-bud spurs. 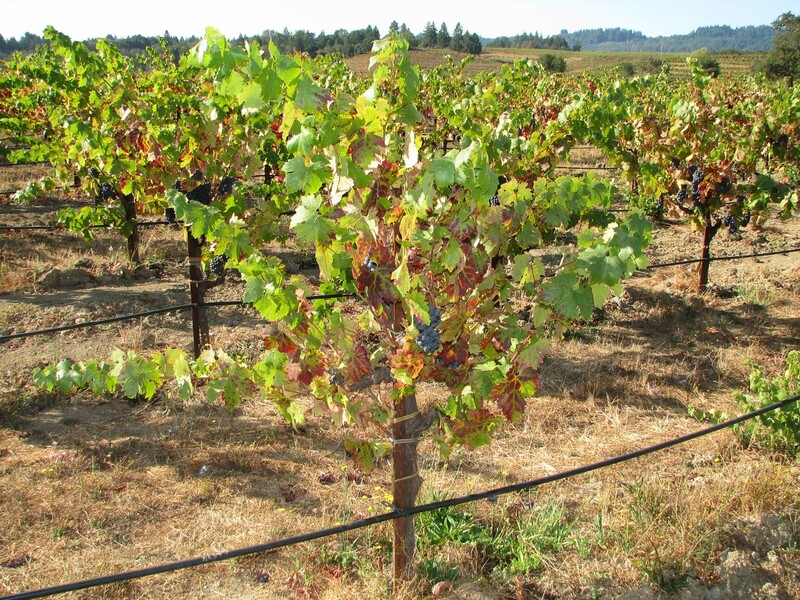 Cultural practices were typical for head trained Zinfandel in California. Data presented in Table 1 (below) were taken on a per-vine basis; berry weight and juice maturity indices were found by replicate (data not shown). At full bloom on 9-June 2012, petioles were collected by replicate for nutritional analyses. Dormant canes were collected from 15 vines on 25-February 2010 and analyzed for grapevine leafroll-associated viruses 1-5, 7 and 9, grapevine stem lesion-associated virus, vitiviruses (GVA, GVB, GVD), and Ruprestris stem pitting-associated virus (RSPaV) by conventional PCR. Blades were collected from these vines 1-October 2010 and 1-June 2012 for nutritional analyses. On 18-June 2012 one vine was randomly selected per replicate in 3 replications and tested for GRaV-2 and GLRaV-3 with real-time RT-PCR. Petioles were collected from each vine utilizing disposable gloves to prevent contamination of plant sap between samples. 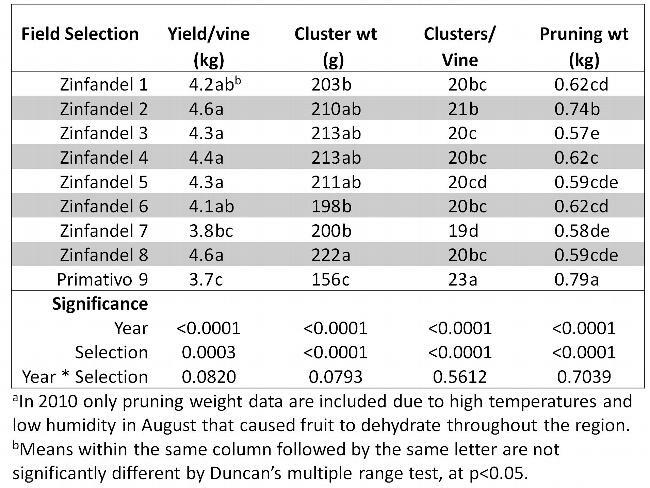 There were significant differences in growth and yield parameters among field selections within years (data not shown); however selection effects on yield, pruning weight and cluster number and weight were independent of year (Table 1). The Primativo selection had significantly less yield, smaller clusters, greater number of clusters and highest pruning weights than all Zinfandel selections. There were no significant differences in field selections in percent nitrogen, phosphorous or potassium (%NPK) in petioles collected bloom 2012. Results of virus testing of 15 vines in 2010 indicated 5 replicates with one or more vines positive for GLRaV-2; other leafroll associated viruses were negative in all samples. Two vines tested positive for GVB and one vine for GVD. All but one vine tested positive for RSPaV. In 2012 virus testing of 27 vines indicated 10 were positive for GLRaV-2 and two of these vines were also positive for GLRaV-3. Data collected by vine were analyzed with respect to the presence and absence of GRLaV-2. There were no significant differences in % NPK in blades from vines testing positive and negative for GLRaV-2 collected on either tissue sample date. 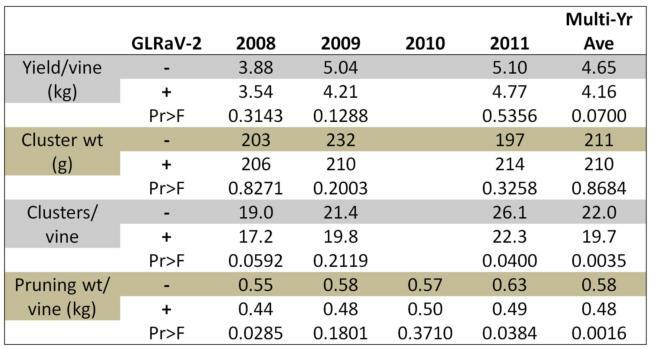 The presence of GLRaV-2 resulted in significantly fewer clusters per vine and reduced pruning weights as compared to vines testing negative for the virus (Table 2 - below). This is consistent with the standard production practice of adjusting cluster number per vine based on vine size (number and length of canes); diseased vines are more likely to have more clusters removed to ensure ripening than are vines with greater growth. Vine yield is reduced in vines infected with GLRaV-2 however not significantly. Cluster weight was not affected by GLRaV-2 in this trial. All vines shown are GLRaV-2 positive. Click on small images for higher resolution photos. 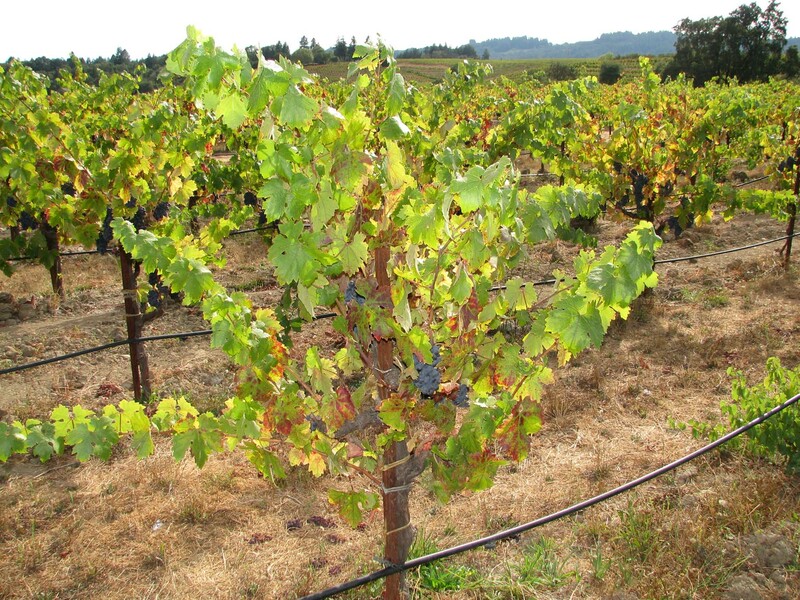 Vine growth and subsequently cluster number is reduced in Zinfandel vines infected by GLRaV-2. The reduction in cluster number may be due to practices performed to insure fruit ripening in smaller vines. Wine makers and growers should reconsider the risk associated with planting diseased vines given that sustained production may not be possible.